Felicia Guo started painting at the age of 10. As a teenager, she moved from Indonesia to study oil painting at the China Central Academy of Fine Arts in Beijing. It was not long until she’d started her own gallery in Jakarta. But, with little business experience, she found its day-to-day management a challenge. 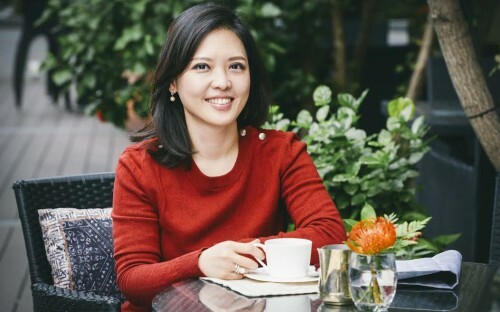 So, in 2014, she moved back to Beijing – her ‘second home’ – to pursue a 14-month full-time MBA program at Cheung Kong Graduate School of Business (CKGSB), focused on finance investment, corporate strategy, and marketing. At CKGSB, she met her two current business partners. She’s since expanded her business activities internationally – Fang Gallery has been exhibited in the world's major art exhibitions, from Singapore to Switzerland – and launched a new contemporary Chinese art gallery in Beijing. She’s also co-founded Idart, a tech start-up which makes art collection and investment more accessible online. Why did you decide to pursue an MBA at CKGSB? I’d spent my career working in art. But, after I opened my gallery, I found managing employees and doing everyday management tasks was quite a challenge. Running an art gallery, you need to know about more than art itself. That’s when I decided that I needed to get an MBA. CKGSB was highly recommended to me by a friend who I respected very much in the industry. The school was also supported by the Li Ka Shing Foundation – started by a Hong Kong businessman I really admire. Plus, CKGSB was in Beijing. I deal mostly with Chinese art and travel between Indonesia and China – CKGSB was the only school that I considered. How have you profited from your MBA experience at CKGSB? I gained a lot. Now, when I go to meetings with people from other industries, I know what they’re talking about. I think the most important thing is, not just the network, but the true friendships that you are able to form with your classmates over the 14-month MBA. In fact, two of my current business partners were former MBA colleagues at CKGSB. Before the MBA, I was doing it all on my own. Now, I’m much happier. I have two great partners and each of us contribute in different ways. CKGSB was crucial for me in expanding to Beijing. I wouldn’t be as fulfilled with what I’m working on today without CKGSB. Why did you decide to launch a new business in Beijing? China has always been a very good place to start a new business. 10 years ago, the art market in Indonesia and Southeast Asia was pretty big. But, in recent years, the art market has boomed in China. Now, China is the art hub in Asia. Most of the contemporary artists that we see at auction houses are from Beijing. Starting a startup company is like a new trend; everybody is doing it! But it’s not easy to start your own business. What I’ve learned is that many people don’t go into it with the right mentality. They put an effort in for one year and then they’re done – they just give up when confronted with challenges. If you’re sure this is what you’re going to do, then you have to be dedicated to it. Hang on in there and don’t give up! If you’re considering whether to do an MBA or not, I’d say go for it! I didn’t study business before so an MBA was very important for me. It broadened my knowledge and gave me a different perspective. With an MBA, you have more options in your professional life, and more freedom in choosing what you want to do. When choosing a business school, ask for advice from people that you respect in your field. Talk to MBA students and alumni so you can get an insight.